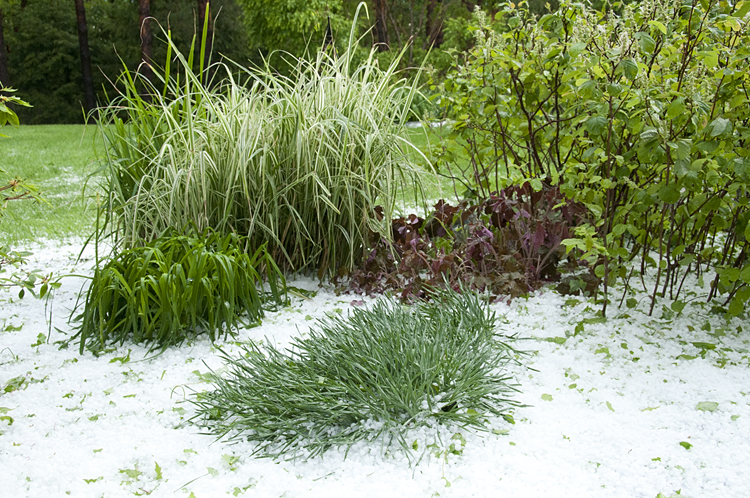 Shortly after we arrived at our farm on Friday, the skies darkened and our hill was pelted with hail. 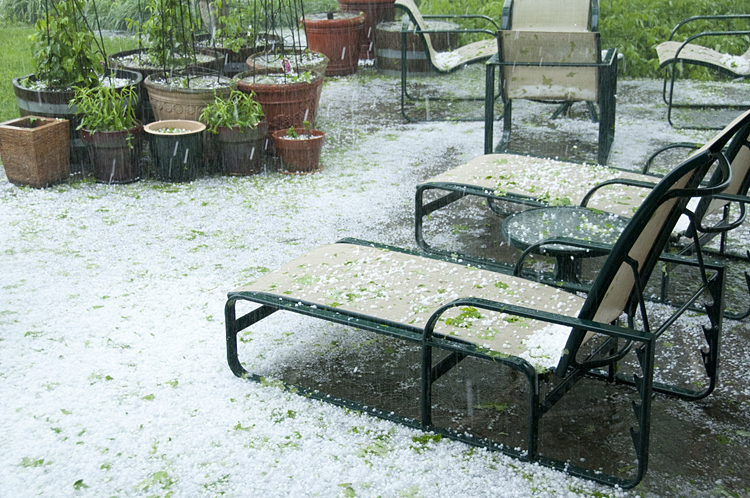 Usually a hail storm only lasts a few minutes, and these were really big hailstones, so I ran for my camera. Turns out that I didn’t have to run. There was wave after wave of hail, followed by torrential rain. I began to wonder whether the Rapture people were right after all – that the end of the world had arrived!! You can see the hailstones bouncing around. The plants in the pots are being pummeled. They are REALLY big hailstones! The storm lasted about 45 minutes. It seemed like a lifetime. When my husband and I walked around to survey the damage, the grass crunched under our feet. The asparagus in the vegetable garden looked fringed on top. Any late tulips were history. The leaves of the large maple tree overlooking the patio are now all over the patio. Bits of leaves were glued to our windows. 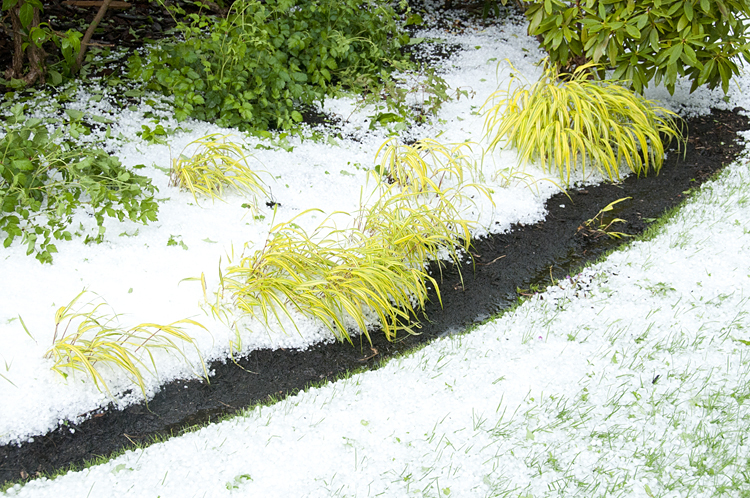 The hail was deepest on the patio and on the soil and mulch in the garden. In some places, the runoff was like a river. There are piles of mulch, soil and debris all over our lawn. 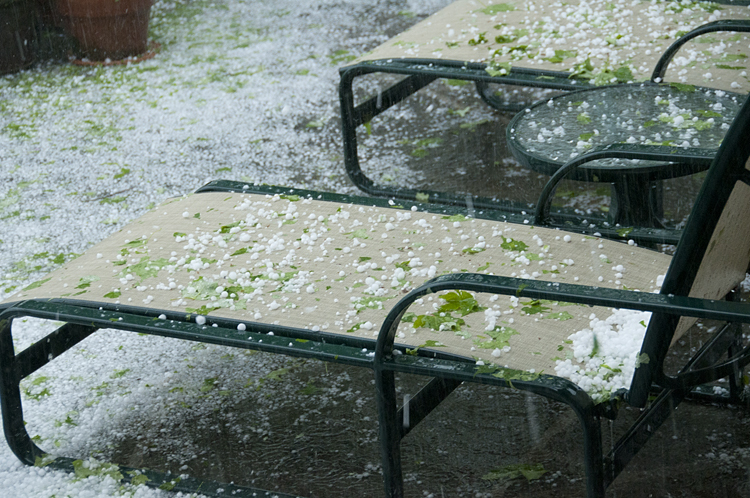 The oddest thing is that a mere mile from us, there was a little hail and no damage. Mother Nature can be very arbitrary. As we bemoaned the fact that we had just planted giant zinnias and other annuals grown from seed, all destroyed, I had one thought. In the Midwest, people were looking at their HOMES totally destroyed. We were looking at plants. You can replant flowers and foliage. Maybe it wasn’t such a calamity after all.